It's been well documented that money can't buy you love, but it might be able to buy a bit of retail happiness. As part of the POPSUGAR Insights "Find Your Happy" study, we surveyed women to determine what it means to be happy in specific vertical categories, including shopping for clothes. 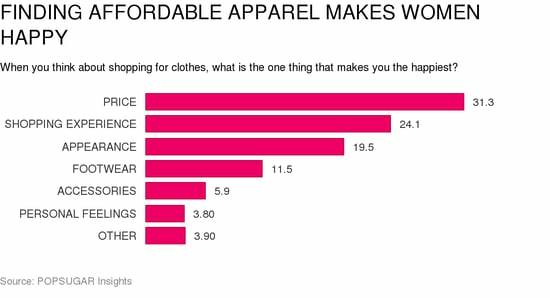 Overall, 31% of women said it's the price that matters most in delivering retail-apparel happiness, with 11% specifically focusing on finding clothing at an affordable price. Price was especially important to married women (43%), women between the ages of 25 and 34 (41%), and moms (39%) when the discretionary income perhaps once spent on clothing is most likely now being spent in other household areas. Over 29% of women cited specific types of clothing or aspects related to the clothing as making them happiest, including finding the right fit (14%). Twenty-four percent of women said it was the shopping experience that made them happiest. This included 11% of women who cited the act of discovering the perfect outfit as making them happiest and 7% of women who just enjoy shopping in general. Teens are more likely to enjoy the act of shopping (10%). Nineteen percent of women said that their appearance, especially the ability to showcase their own personal style via their purchases, was what makes them happiest. This was especially true of teens (27%) and students (23%), with the ability to "express myself through what I wear" and "looking good overall" being especially popular with teens. Eleven percent of women said that shopping for footwear was what make them happiest, and 6% of women said that apparel accessories like purses and handbags make them happy, especially among women 25-34.